Don’t just sort a few of the tall, small, & fall letters – sort them all! Cut out the letters and glue them into the matching category. This is a four page set. Two pages of letters are provided – cut the letters out individually or save cutting time and cut on the shared lines. An answer sheet is provided to make your job checking your kid’s papers easier . 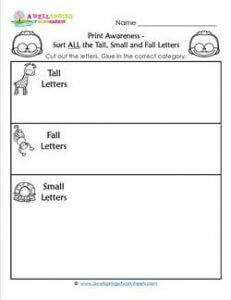 Check out this page to see all the tall, small, and fall resources on this site.